Picture by Alex Whitehead/SWpix.com - 04/05/2018 - Cycling - 2018 Tour de Yorkshire - Stage 2: Barnsley to Ilkley - The peloton travel through Garforth. Entries can now be submitted for the 2019 Tour de Yorkshire Best Dressed Competition - which honours communities and individuals that go the extra mile to celebrate the race . The competition – organised in partnership with the Yorkshire Post - has four categories: Best Dressed Village, Best Dressed Town, Best Dressed Host Location and Spirit of Le Tour. 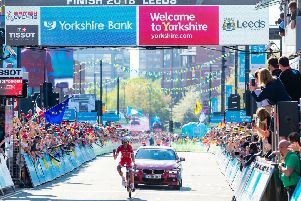 Peter Dodd, Commercial Director, Welcome to Yorkshire, said: “Every year we’re blown away by the creativity of people who pull out all the stops to decorate their home towns and villages to celebrate the Tour de Yorkshire - which is so much more than a bike race, it’s about bringing people together. The Best Dressed awards will be given to locations with the most spectacular, eye-catching decorations. The Spirit of Le Tour award will recognise an individual, community or business which has gone above and beyond to fully embrace the essence of the Tour de Yorkshire in a unique way. Previous races have been celebrated with everything from spotty houses, dyed sheep, miles of handmade bunting, fantastic floral displays and incredible yarn bombing. This year’s Tour de Yorkshire passes through 151 villages, towns and cities with images of our county set to be beamed to 190 countries across the world, showcasing Yorkshire at its very best. After the race - which runs from 2-5 May - a shortlist of the best entries will be drawn up by a panel of judges and the winner of each category will be presented with an exclusive commemorative plaque to display in their community. The Best Dressed Competition was launched in 2018 with Kippax (Best Dressed Village), Hornsea (Best Dressed Town) and Ilkley (Best Dressed Host Location) all emerging victorious. Samantha Whitley from Garforth was awarded the Spirit of Le Tour prize for her tireless work in the community.